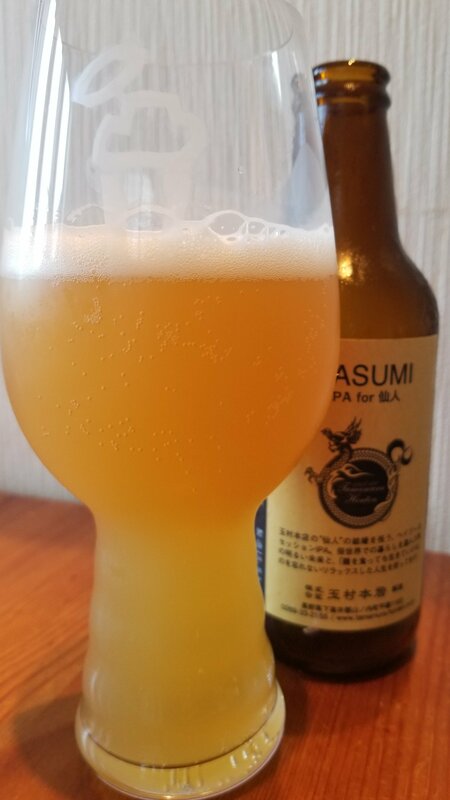 Shiga Kogen Kasumi, or to give it its full name of Shiga Kogen Kasumi IPA for Sennin, is a 4.5% session IPA from Tamamura Honten, based in Nagano, Japan. It’s part of their limited edition range of beers and can be found in both bottles and on tap across Japan. Shiga Kogen Kasumi was first released in May 2018, though this is a bottle from their second batch, released in August 2018. Unlike other Shiga Kogen beers, Shiga Kogen Kasumi uses 100% Golden Malt imported from the UK. Shiga Kogen Kasumi is billed as a hazy session IPA – can we please drop the hazy thing now? Please?! Pretty please?! and that’s what it came out like. A lurid hazy orange colour with some sediment at the bottom of the glass. It had a strong astringent grapefruit aroma with a hint of pineapple going on as well. For a Shiga Kogen beer, Shiga Kogen Kasumi was fairly one dimensional in the aroma, with barely any hint of malt coming through. The body was incredibly thin and astringent with a light grapefruit taste to it. Shiga Kogen Kasumi would be nice for a hot summer’s day if you’re looking for some refreshing but as for something tasty? The grapefruit and herbal hop flavour was much much stronger than the malts but the thin body just left an astringent flavour on the tongue during the aftertaste. The lack of body to Shiga Kogen Kasumi really lets it down – if it had been stronger then Shiga Kogen Kasumi would be recommended.